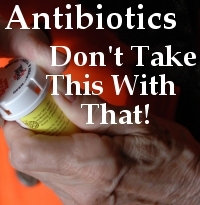 Antibiotics – Don’t Take This With That! Antibiotics are medicines that help stop bacterial infections. Protect yourself and your family by taking them correctly. There are times when you should and when you should not take antibiotics. In children, antibiotics are the most common cause of emergency department visits for adverse drug events. 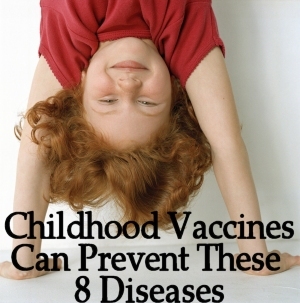 Rest, fluids, and over-the-counter products may be your or your child’s best treatment option. And NEVER give a child under the age of 19 aspirin or aspirin containing products, as it could trigger Reye’s Syndrome, a deadly disease! Viruses and bacteria are the two main types of germs that cause infection. Antibiotics cannot kill viruses but can kill bacteria. Viral infections should not be treated with antibiotics. Common cold – stuffy nose, sore throat, sneezing, cough headache. Influenza (flu) – fever, chills, body aches, headache, sore throat, dry cough. Acute bronchitis (cough, fever) – almost always caused by viruses. Pharyngitis (sore throat) – most sore throats are caused by viruses and are not effectively treated with an antibiotic. Ear infections – antibiotics are used for most, but not all ear infections. Severe sinus infections – lasting two or more weeks. Antibiotics can sometimes interact with other medicines or other substances. This means that the effects of one of the medicines can be altered by the other. Some of the more common interactions are listed below. However, this is not a complete list. If you want to check that your medicines are safe to take with your antibiotics, ask your GP or local pharmacist. You should also always carefully read the patient information leaflet that comes with your medicine. Antibiotics may cause your combined oral contraceptive pill to be less effective at preventing pregnancy. Women taking combined oral contraceptives should use an extra method of contraception (for example, condoms) while taking the antibiotics and, in some cases, for seven days after finishing the course. Your GP will be able to advise you. It is usually recommended that you avoid taking penicillin at the same time as a medication called methotrexate, which is used to treat some types of cancers and severe autoimmune conditions such as the skin condition psoriasis. This is because combining the two medications can cause a range of unpleasant and sometimes serious side effects. You may experience a skin rash if you take penicillin and a medication called allopurinol, which is used to treat gout. Cephalosporins may not be suitable to take if you are also taking blood-thinning medications such as heparin and warfarin. If you need treatment with cephalosporins, you may temporarily have to stop taking the blood-thinning medication. However, the risk of kidney and hearing damage has to be balanced against the benefits of using aminoglycosides to treat life-threatening conditions such as meningitis. Antibiotics that can cause Sun Sensitivity include: Doxycycline, tetracycline, ciprofloxacin, ofloxacin, levofloxacin, trimethoprim. In some people, the sensitivity can last long after the antibiotic regimine is complete. Phototoxicity. This is the most common type of sun-sensitivity drug reaction. It can occur when skin is exposed to the sun after certain medications are injected, taken orally, or applied to the skin. The drug absorbs the UV light, then releases it into the skin, causing cell death. Within a few days, symptoms appear on the exposed areas of the body. In some people, symptoms can persist up to 20 years after the medication is stopped. Among the most common phototoxic drugs are the tetracycline family, NSAIDs (nonsteroidal anti-inflammatory drugs such as ibuprofen), and amiodarone (Cordarone, a heart medication). It’s important to note that not every person who uses these drugs has a reaction. If it does happen, it can be a one-time occurrence, or it can happen each time the drug is taken and sun exposure occurs. People with HIV are among the most likely group to experience sun sensitivity to drugs. Can I drink alcohol when on an antibiotic? Alcohol is a drug and in combination with other drugs including antibiotics, can cause an interaction with undesirable results. Ask your doctor about your specific medication, but in general, you should avoid combining alcohol with any medication. A list of ingredients to avoid, (other names for aspirin) can be downloaded here, or you can email the NRSF for a wallet size card(s) you can carry with you when shopping for medications.